How Big Does a Horse Stall Need to Be? Horses come in different sizes, and so should the stalls they live in. The size of your horse's stall will depend on how large he is and how much time he spends there. Keeping a horse in a stall that's too small for him can result in behavioral issues under saddle and other bad habits. As a general rule, a horse's stall should be large enough for him to lie down and turn around easily. It should allow him space to lower his head and graze on hay. A 1,000-pound horse is comfortable in a 12-by-12-foot stall. Ponies and small horses who weigh less than 900 pounds can live in a 10-by-10-foot stall. Larger horses, such as drafts or warmbloods, require more space. A 14-by-14-foot or even 16-by16-foot stall is ideal. Miniature horses do well in a 6-by 8-foot stall. House your horse in the correct stall for his size. Too small a stall can result in habits such as pacing, cribbing or stall kicking. A horse can become cast more easily in a stall that isn't large enough. Too large a stall requires more bedding and takes longer to clean. What are Common Indications That Your Horse is Bored When Left in His Stall? 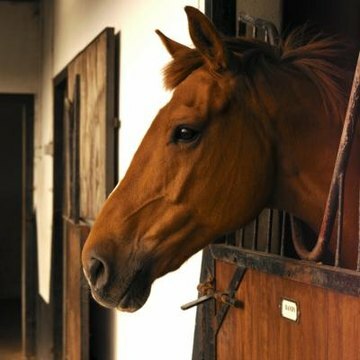 Do Horses Need Box Stalls? What Size of a Corral or Paddock for a Horse? How Long Should a Training Session Be for a Horse?